All families have hopes and dreams for their children. 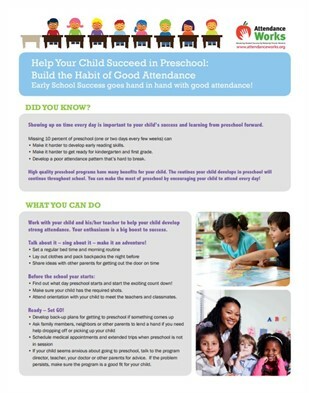 Good attendance matters for school success, starting as early prekindergarten and throughout elementary school. By middle and high school, poor attendance is a leading indicator of dropout. Being in school every day will enable children to do well in school, and graduate from high school ready for work or college. Develop a regular bedtime and morning routine. Help your child lay out clothes and pack backpacks the night before. Make sure your child has the required shots before school starts. 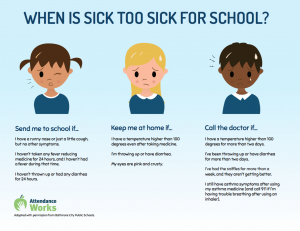 Avoid missing school unless a child is truly sick and seek help if chronic illness is a challenge. If your child seems anxious about going to school, talk to teachers, school counselors, or other families for advice on how to make her feel comfortable and excited about learning. 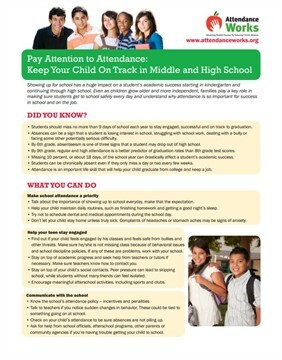 Reach out to a family member, a neighbor, or another parent if you are having trouble getting your student to school. Arrange medical appointments when school is not in session. Avoid extended vacations when school is in session. 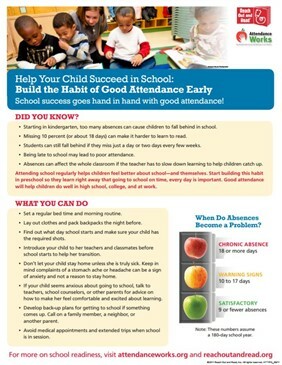 These resources can help with any issue relating to attendance. You will find school contacts, programs, and community resources to support you and your child.